Men's Black Textured Wedding Ring : LOVE2HAVE in the UK! 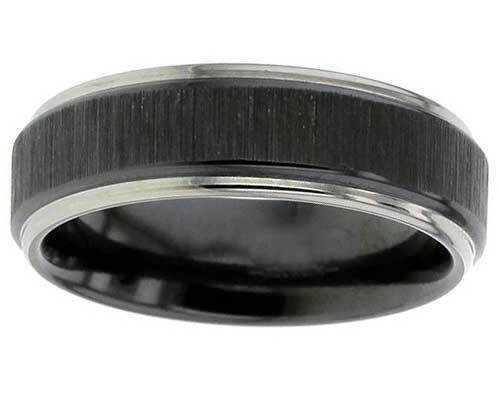 Here we have a men's wedding ring with black textured detailing. We sell a lot of jewellery on our website that have distressed textured surfaces both in silver and titanium. Our customers love the way that some of our jewellery can look aged, even when bought new, which is very Rock n' Roll. With this in mind, we were delighted to discover this men's zirconium wedding ring which is one of a kind and falls within the same remit as our other distressed textured pieces. Even though we list some titanium rings with distressed finishes, this is the only zirconium ring we have come across that features something similar. This ring comes in a two-tone finish with a raised satin finish black rail that has a linear textured surface that runs 90 degrees to the edging all the way around the ring. The naturally polished zirconium is shoulder cut from the raised rail. The ring measures 7mm wide.